We are perched on the brink of the coldest weather of the year here in Ohio, so now is the best time to make sure that your furnace is running with the minimum amount of problems. If you need to schedule furnace repair in Columbus, OH, don’t hesitate about calling up an expert contractor like Quality Air Heating and Air Conditioning—you don’t want to get stuck with a broken furnace on the coldest day of the year. But prevention is the best method when it comes to repair, and we have some advice that will help you minimize your repair needs for the coming winter. Take good care of your furnace so it will take good care of you! Don’t overwork it: The most common way that people press their furnace into working too hard is by pushing the thermostat up as high as it can go, believing this will warm up their homes much faster. But a higher thermostat level will only make a heating system stay on much longer when it doesn’t need to. Provide your furnace with a level on the thermostat that will only make it run long enough to keep you comfortable. Regularly replace the air filter: A furnace’s air filter performs the important function of trapping debris that might otherwise damage the components inside the cabinet. During the winter season, when your heating system is working its hardest, you might need to change this filter as often as once a month. If the filter goes without changing, it will become so clogged that it will overwork the heater and allow debris to get inside. Schedule preventive maintenance: If you haven’t yet enrolled in a preventive maintenance program with a dependable HVAC company, you could be wasting money. Your furnace needs to have an annual check-up to make sure it is functioning correctly and not developing problems that will lead to repairs. Technicians will catch any potential malfunctions and fix them, and the tune-up your furnace will receive will keep it operating smoothly afterwards. There is no better way to prevent repairs… and a furnace working its best will also save you money on your heating bills! Quality Air Heating and Air Conditioning is here to assist you. We can perform any repairs you need, and we can help you prevent them as well. Sign up for one of our maintenance plans, and you’ll also receive preferred service and 20% off all repairs. 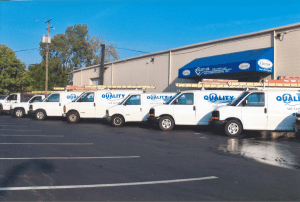 For furnace repair in Columbus, OH, look to our highly-trained staff at Quality Air Heating and Air Conditioning.